Units are available form 3.0 to 5.0 TR EER ranges from 12.0 to 12.7 Unit works on R410a Ecofriendly refrigerant Gas. 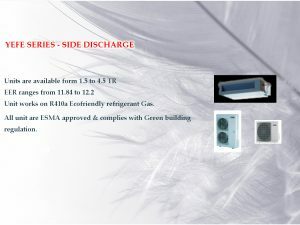 All unit are ESMA approved & complies with Green building regulation. 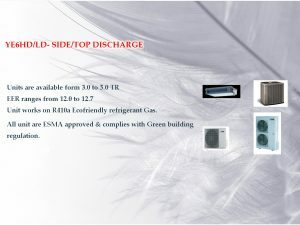 Units are available form 1.5 to 4.5 TR EER ranges from 11.84 to 12.2 Unit works on R410a Ecofriendly refrigerant Gas. All unit are ESMA approved & complies with Green building regulation.